The 23-year-old American is looking for a job as he closes out his season at the Tour of Hainan. 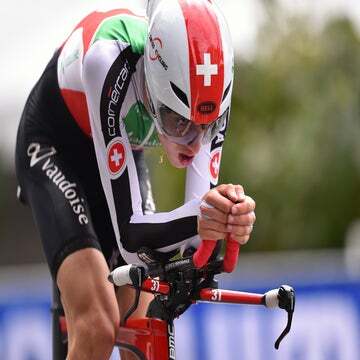 DANZHOU, China (VN) — Tyler Williams (Israel Cycling Academy) must race nearly 1,500 kilometers around the Chinese tourist island of Hainan while considering his 2019 options. Without an option to continue with Team Israel Cycling Academy, the 23-year-old is searching the market for a new deal. “Me and half the peloton are still looking for a team,” Williams said. “It seems that way. Williams began the 13th edition of the Tour of Hainan Tuesday. The race covers the roads of the island just off the southeast coast near Vietnam. Neither the resort hotels nor the warm weather take the 2019 season off Williams’s mind. With several teams closing and others reducing their rosters, many riders are searching for jobs but few are landing deals for next season. “I’ve been on a good path. I enjoy racing all over the world. I’ve been in Europe, Asia and America,” Williams said. Williams, 23, worked his way from Santa Rosa, California, in the development ranks. He raced with the BMC development team and Axel Merckx’s Axeon-Hagens Berman franchise. In 2017 and 2018, he rode in the blue Israeli colors. The team this year entered the Giro d’Italia, which began in the holy land of Jerusalem. Williams raced elsewhere, including Scheldeprijs, Brabantse Pijl and the Amstel Gold Race. “2018 was good. Every season is more or less up and down at points. It started off great, I had a lot of good performances in the classics in the spring,” he continued. “The summer was a bit of slump, but I was able to go great at Tour of Taihu Lake and had fifth in the GC, which was a nice result for myself. Williams traveled from California overseas 16 times this year for races in Europe and Asia. He feels some jet lag but said he has gotten used to it.